Sony's Xperia XA line is still fairly young, with two generations of devices behind its back. It usually introduces a pair of devices — a “regular-sized” XA and phablet-grade XA Ultra. They are midrange handsets with super-thin side bezels, but still hefty chin and forehead, and are geared towards selfie-loving camera users, with high-res front and back cameras and LED flashes for both. With the Xperia XA1 and XA1 Ultra soon to be a year old, odds are good that Sony will be introducing a new pair soon. 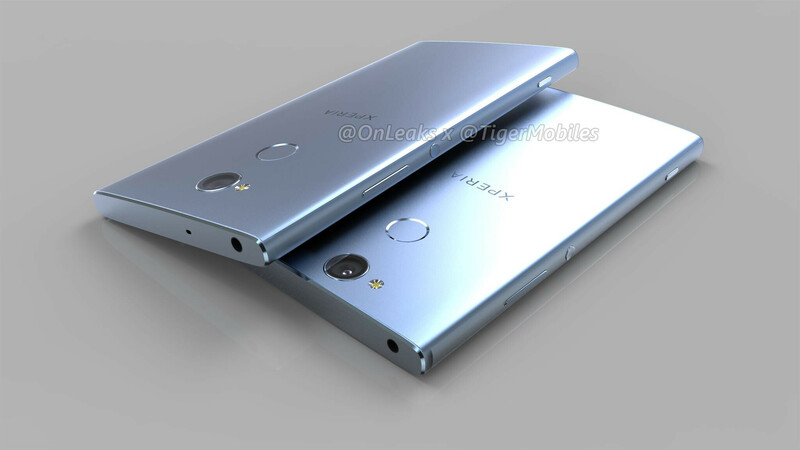 And a supposed leak has showed us just what the Xperia XA2 and XA2 Ultra might look like just a couple of days ago — same razor-thin side bezels, same chin and forehead. Now, serial leakster @OnLeaks, who happens to have a pretty good track record on this type of leaks, has tweeted rendered images, which are allegedly based on leaked dimensions, which website Tiger Mobiles somehow got a hold of. We see the rear-mounted fingerprint scanner re-iterated — this would be a first for Sony, who has been putting the biometric reader on the side of its phones up until now and could possibly mean that US-bound Xperias might finally get fingerprint scanners. We also get to see that the shape hasn't evolved much beyond having a slightly arched back — this could be great for ergonomics on a huge device like the XA2 Ultra. Other than that, we still don't have much on any potential specs besides an earlier leak regarding the Xperia XA2 Ultra — 6-inch 1080 x 1920 display, Qualcomm Snapdragon 630 SoC, 4 GB of RAM, 64 GB of storage, a 21 MP main camera and a mysterious dual selfie camera. The regular Xperia XA2 will likely have lower-tier specs, but we have nothing on them yet. Even though Sony has used this design since the XZ, I still like it. The XZ1 is the best designed phone till date if you ask me. Is it true that the thickness is 9.5mmm. If it is it sure is a big fail again for Sony. I can never understand peoples obsession with paper thin phones, anything up to around 11mm is fine with me. If it's thick the phone better have bigger battery. The slimness of a phone feels good in the hand. Back is a bit curved, so the 9.5 would be the center. It looks curvy like 2015 Motorola phones. There are gossips about 3200 mAh for XA2 and almost 4000 for Ultra. I dont know if this info is faithful. They need to cut their top and bottom bazels. This is 2018 not 2014 . Everyone is going bazeless even for their mid range phone, Sony should do this too if they want to survive this market. Nobody tells Motorola to do it.. Curious why. For the smaller one I agree it could be a bit smaller, maybe 3mm. But ppl forget the Ultra has front cam with same size of rear camera of Pixel and iphone X. The smaller is 5.2", same screen of XZs.